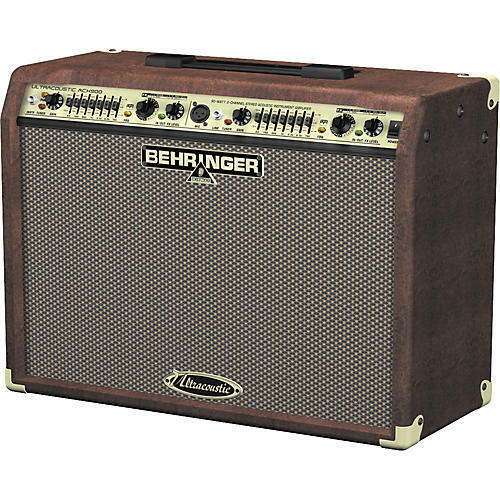 The Behringer ACX900 is a 90W, two channel guitar amplifier that features 2 - 8" speakers for true acoustic fidelity. It includes 2 independent FX processors and an ultramusical, 7-band graphic EQ for each channel plus the revolutionary FBQ Feedback Detection system to reduce feedback in an instant. In addition, the ACX900 holds a dedicated Tuner switch per channel for use with an external tuner, FX inserts, and a balanced stereo XLR Line out with Ground Lift switch to enable a direct connection to your mixing console. The speaker cab also comes with a dual footswitch FS112.